Procurement cards are essentially credit cards that are used by designated employees to purchase small-dollar items without any prior authorization. Their use greatly reduces the labor of the purchasing department, which can instead focus its purchasing efforts on large-dollar items. However, because the use of procurement cards falls completely outside the normal set of controls used for the procurement cycle, an entirely different set of controls are needed. 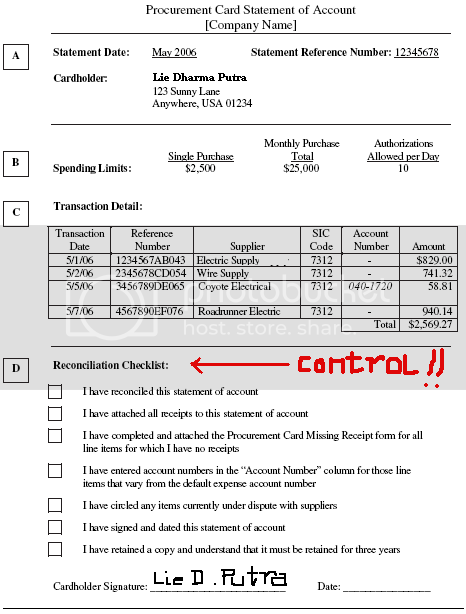 Another key control is to reconcile the transaction log with the monthly card statement. Each card holder must review his or her monthly purchases, as itemized by the card issuer on the monthly card statement. A sample of the statement of account used for this reconciliation is shown below, where it is assumed that the company obtains an electronic feed of all procurement card transactions from the card provider, and dumps this information into individualized reports for each card user. 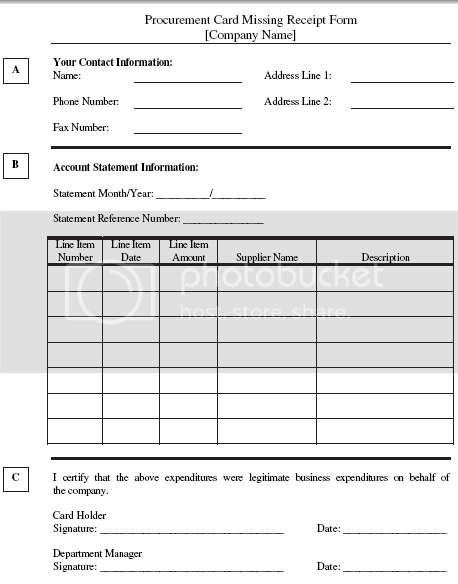 This approach provides each user with a convenient checklist of reconciliation activities within the statement of account, but the same result can be obtained by stapling a reconciliation activity checklist to a copy of the bank statement. In addition, there must be an organized mechanism for card holders to reject line items on the statement of account. 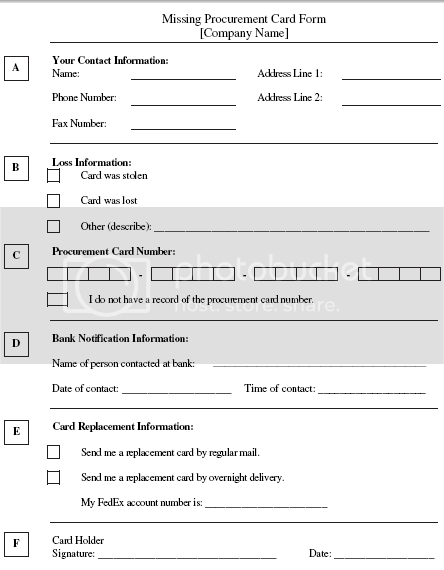 A good approach is to use a procurement card line item rejection form, as shown below, which users can send directly to the card issuer. Finally, there must be a third-party review of all purchases made with procurement cards. An effective control is to hand this task to the person having budgetary responsibility for the department in which the card holder works. By doing so, the reviewer is more likely to conduct a detailed review of purchases that will be charged against his or her budget.